Cameroon coach Denis Lavagne wants Samuel Eto'o removed as captain when he returns from suspension in August. In a letter to Cameroon's football federation head Iya Mohamed, the Frenchman said the change should be made by early September. "I request the designation of a captain and vice-captain in the national team," Lavagne wrote. "My staff and I think it is necessary to definitively clarify the captaincy issue before our next qualifier." "We think a working session should be held to designate the captains." Cameroon's next competitive match is when the four-time African champions travel to Cape Verde for a 2013 Africa Cup of Nations qualifier on the weekend of 08-09 September. During three qualifying matches in June, Cameroon had two captains - with goalkeeper Idriss Carlos Kameni and defender Nicolas Nkoulou sharing the armband. Sources indicate that Kameni looks well-placed to take the captaincy on a permanent basis, with Stephane Mbia being touted as his vice-captain. 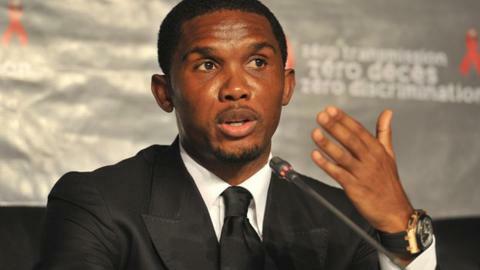 Eto'o, who assumed the captaincy in 2009 from Rigobert Song, was barred from the team by the Cameroon federation (Fecafoot) after he led a player strike in a row over bonuses last November. His actions prompted an eight-month ban, which is due to end on 7 August. Lavagne's letter was dated 20 June but only appeared in the public domain on Thursday. The French coach also complained that his annual salary of roughly US$245,000 has not been paid. He said his contract stipulated it should be paid in a lump sum. Lavagne, who was recently warned by the federation for being disrespectful to a government minister, was appointed as Cameroon coach last year.